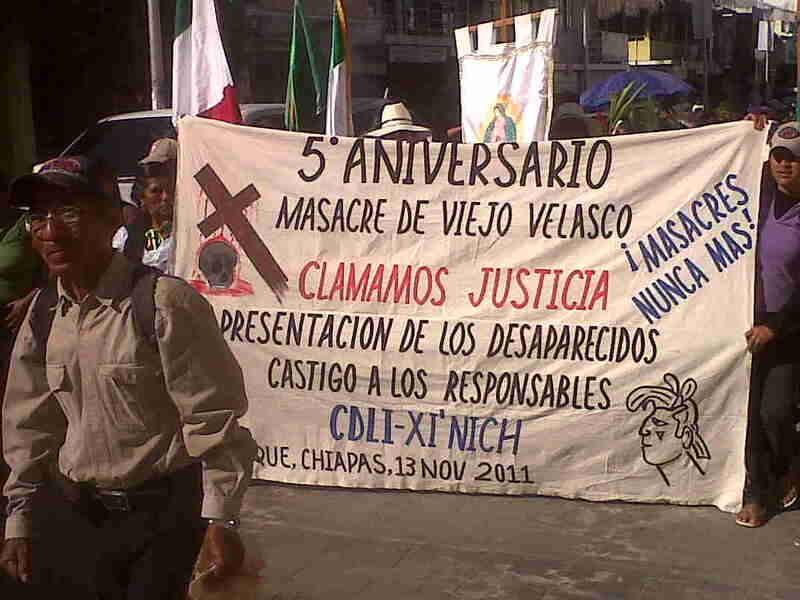 Seven years after the ignored massacre of defenseless and peaceful Indigenous in Viejo Velasco Suárez community, in the Lacandón Jungle in the northern part of Ocosingo municipality, there is only government disdain, and not only impunity for the material and intellectual authors of the act, but also criminalization of neighbors from the Nuevo Tila ejido that aided the victims, their compañeros. That, while it is known through numerous direct testimonies that the crime was perpetrated by Tzeltal residents of the so-called Lacandón Community coming from Nueva Palestina and state police, in the presence of the Lacandón authorities of Lacanjá Chansayab. In a Kafkaesque logic, the state’s Attorney General (PGJE) blamed the innocent ones that helped out. Thus, they tortured and held Diego Arcos Meneses, from Nuevo Tila, prisoner for a year, and arrest warrants currently exist against more residents of the same ejido. The Chols Antonio Álvarez López and Juan Peñate Díaz are filing for a injunction (amparo) to protect them from arrest. Another two are about to do it. Their innocence is obvious in the four cases, and above all their “guilt” was being in solidarity with the Viejo Velasco Suárez victims, a town now abandoned and destroyed in the Lacandón Jungle. On November 13, 2006, during the government of Pablo Salazar Mendiguchía, around 40 individuals dressed in civilian clothing, coming from Nueva Palestina, accompanied by some 300 agents from the then Sectorial Police attacked with firearms the Tzeltal, Tzotzil and Chol families that used to live in Viejo Velasco. The attack left seven dead from these families, two disappeared (very probably dead, which would be nine murdered), the displacement of 20 men, eight women, five boys and three girls. Petrona Núñez González, a survivor of the massacre, died in 2010, as a consequence of post-traumatic stress. Demanding that the State do “everything necessary to find out the truth about what happened and so that those responsible are sanctioned,” reiterated that Mariano Pérez Guzmán and Juan Antonio Peñate López continue disappeared “and the police investigations have been stopped, before a lack de interest from the PGJE to find their whereabouts.” Meanwhile, the state authorities continue without investigating or arresting those responsible for “this action of a paramilitary cut.” According to investigations of the state attorney general, Frayba, Desmi, Serapaz, Xi’Nich, Sadec and others add (13/11/13), the responsibility corresponds to members of the Organización For the Defense of Indigenous and Campesino Rights (OPDDIC) of Nueva Palestina and to members of the state’s Sectorial Police. On the other hand, the PGJE continues legal harassment against residents of Nuevo Tila, a neighbor community to Viejo Velasco. “They were the first to offer help to the injured, to receive the displaced people and support in the search for the disappeared.” Those ejido owners even received the K’anan Lum “jTatic Samuel Ruiz García” human rights award in 2011. Nevertheless, they are the ones who have arrest warrants. The compañeros of those killed are pursued, not those who it is known carried out the massacre. Their motive is known, and that of their Lacandón accomplices. And the sectorial police did not act on their own account; they were obeying orders.